I for one do not mind being called obscure. But I find it quite disturbing when all bloggers are defined, qualified, or generalized as obscure. Now that Cory Aquino has passed, and the tears have been shed and tributes shared, where does the country go from here? Everyone, from former and incumbent presidents to world leaders, from business tycoons to entertainment moguls, and from former “yellow Friday” activists to obscure blog writers — all have expressed some grief (for the loss of an icon) and gratitude (for the legacy she has left behind). Charge me as being too sensitive but I find it odd that “obscure” had to be used as a qualifier of “blog writers.” Am I wrong for being offended or having felt a bit marginalized by it? I do not question the wisdom of the editorial, there are other occasions and places to do that. I do not even dare critic the way it was written. But why, of all words in the English dictionary, was the word “obscure” singled out to generalize or describe blog writers? Was it to underscore a point? 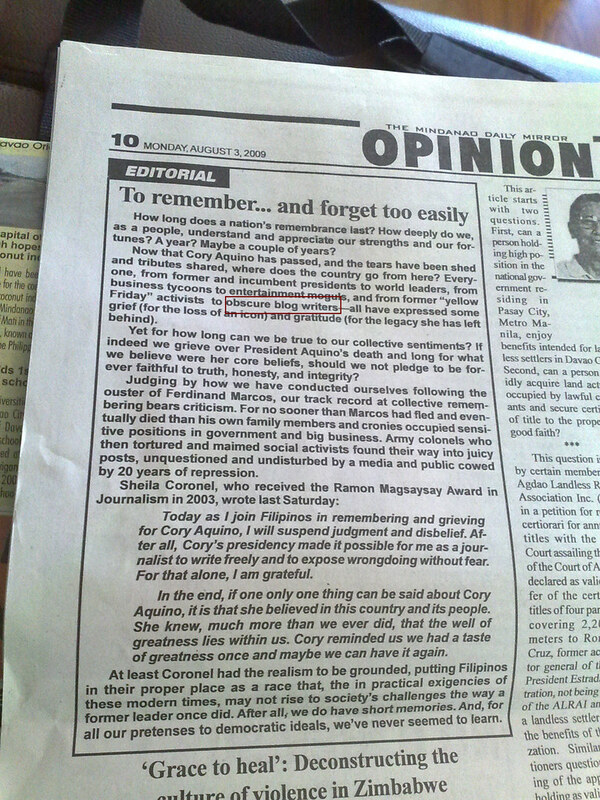 Was it to highlight the fact that even the “obscure” or not so popular ones care enough to write or blog about Cory Aquino’s death? Charge me with being a nitpicker, but I would sincerely love to know why the word “obscure” is there. he underestimates bloggers by calling them/us obscure… but anyway, i don’t really care how they describe bloggers. we blog because we love it. we blog because we think that our blogs are an important part of the society. we provide information and we know that somehow, we help people in what we do. This is from the Mindanao Daily Mirror?! Sheesh.